It is a Malaysian dessert! It is made out of glutinous rice flour, palm sugar, pandan and coconut. When you take a bite of it, a burst of rich palm sugar spills into your mouth. 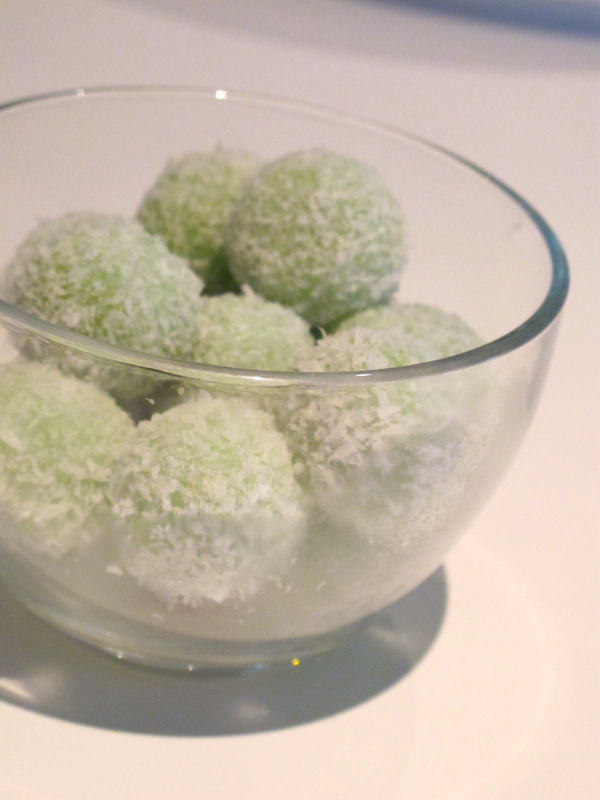 So here's a recipe inspired by Poh's - Sticky Marbles from Masterchef. I had to make a few adjustments from the original recipe. Below is what I've done. 1. Mix the flour with the coconut milk. Transfer to a lightly floured surface. 2. Knead it into a smooth soft dough, add the Pandan essence. Knead till incorporated. 3. Cover with glad wrap until you need to use it - otherwise it'll dry out. 4. Shave and roll the palm sugar into small balls. 5. Pinch a little of the soft dough, roll into a ball and flatten it up so that you can put the palm sugar in it. 6. Seal and roll back into a ball. Set aside. 7. Boil hot water in a pot. Throw in the balls into the water to cook. When it floats to the surface of the water, it is ready to be removed. 8. Remove the balls, just drain it for 3-5 seconds, transfer it to the bowl of desiccated coconut. 9. Roll around to cover the balls. 10. Put on a kitchen towel to absorb the moisture. 11. Eat when it is completely cool. Consumed within the same day. If you put it in the fridge, it might harden. Mary: thank you! it's actually pretty easy..